Bugatti kicks off its anniversary celebrations at the Rétromobile 2019. Anyone can have big dreams, but not everyone gets the opportunity to fulfill them, or has the courage to seize that opportunity when it presents itself. Ettore Bugatti had big dreams, and in 1909 he took his fate in his own hands, and moved to Molsheim with his family to found his own company and write automotive history. A long and eventful 110 years later Bugatti proudly celebrates the anniversary of its creation and Ettore’s legacy. As the only French luxury automotive brand there couldn’t be a more fitting setting for the celebratory kick-off than the 44th edition of the Rétromobile Show. At the Bugatti stand, the visitors of Paris Expo Porte de Versailles will be able to see two highlights of this year’s international classic cars exhibition: the Bugatti Type 55 and the Bugatti EB110 GT. 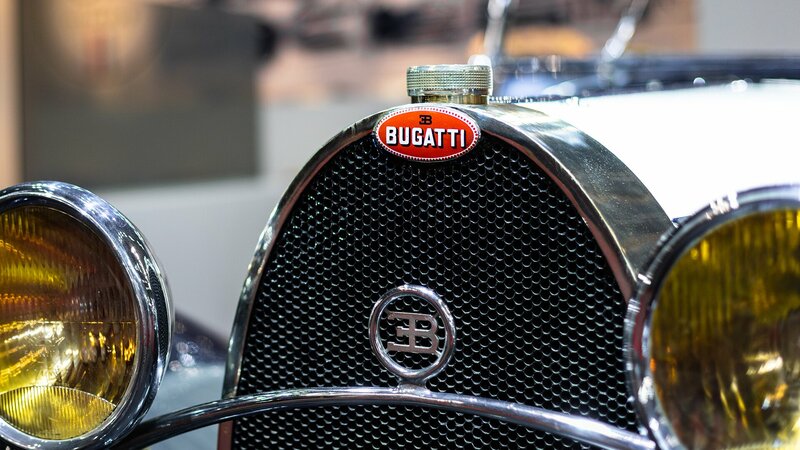 The early steps of Ettore Bugatti, interrupted by World War I, led to the glorious 1920s that lifted Bugatti to the highest heights of the automotive world. With Ettore’s son Jean Bugatti in a prominent role the company defied the Stock Market Crash of 1929 and continued manufacturing some of the most desired automobiles of the 1930s, among them the Bugatti Type 55. In 1931 the Type 51 assumed the large inheritance of the Type 35, to the day the most successful race car in history, as the new Bugatti for grand prix races. Jean Bugatti did not only create the engine of the Type 51, but immediately started working on a version of the Type 51 for the open road, the Type 55. With its top speed of 180 km/h – more than exceptional at the time – was well-received among customers in search of a high performance gran turismo. At the same time it featured one of the most beautiful sports car designs, also masterminded by Jean Bugatti. The bicolor paint, low silhouette, and pure wing line give an impression of elegance, but also one of strength and speed. Bugatti produced 38 units of the Type 55 with roadster and coupe coachworks. Exhibited at Rétromobile by courtesy of the Cité de l’Automobile, National Museum (Schlumpf Collection) in Mulhouse, the Type 55 roadster with the chassis number 55215 was produced in 1932 and sold and shipped in July of the same year to the United States. After 30 years his third US American owner, famous Bugatti collector John Shakespeare, sold the car together with other prestigious vehicles to Fritz Schlumpf who brought this blue-and-white Type 55 back home to Alsace and integrated it into his and his brother’s ample collection. In 1939, Jean Bugatti’s death and the beginning of World War II hit Bugatti harder than the financial crisis had done one decade earlier. After escaping to Bordeaux from the Nazi occupation Ettore came back to Molsheim once the war had ended. During the war, however, the business and his health had suffered and Ettore never recovered, passing away in August of 1947. His son Roland Bugatti took over, but unlike his late brother Jean he did not have the skills, the knowledge nor the luck to turn around the situation. Despite several attempts, he had to sell the company to Hispano-Suiza in 1963. While the car collection mainly ended up in the hands of the mentioned Schlumpf brothers, the company’s tools and know-how were used in the aeronautic development for the next decades. In 1987, however, Romano Artioli revived Bugatti for the automotive world, building a new plant in Campogalliano. The main outcome of his efforts was the unique Bugatti EB110, unveiled in Paris on 15 September 1991, exactly 110 years after Ettore Bugatti's birth. All-wheel drive, a 3.5-liter V12 engine, 560 PS and a maximum torque of 611 Nm converted this Bugatti into the fastest series production car of its time at 351 km/h – in the version EB110 SS (Super Sport). Exhibited at Rétromobile, the grey EB 110 GT (Gran Turismo) with the chassis number ZA9 AB0 1S0 RCD3 9070 was built in 1994. Its journey led from Europe to the Middle East and back to Europe where it is privately owned. After the production of 139 units of the EB110, Campogalliano had to shut its doors. Another setback that only a strong brand like Bugatti could survive. At the hands of the Volkswagen Group, Bugatti was revived again in 1998. The move back to Molsheim marked an important decision: building the future of the company on the very same grounds where its founder Ettore had created his legacy, this year 110 years ago. And just like in Ettore’s time, the vehicles leaving Molsheim are positioned at the very pinnacle of the automotive world. Since 2005 all Bugatti hyper sports cars are assembled in the state-of-the-art Atelier in Molsheim. For the first ten years the Bugatti Veyron 16.4 and its derivatives, since succeeded by the Chiron1, Chiron Sport, and Divo2. All models different in character, but with one outstanding similarity – the unique 8-liter quad-turbo W16 engine. And all in line with one of Ettore Bugatti’s most sacred credo, stating that anything comparable can’t be called Bugatti.